Liston Hotel is a charming venue. This family owned and run hotel offers it's guests and visitors a personal, professional and friendly experience. The hotel is set in peaceful Boscombe Spa, in a matured garden close to Bournemouth's ornamental cliff top gardens and a few minutes from the beaches of Boscombe. 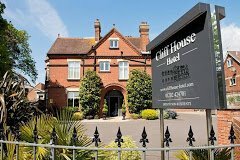 With ornate function room and beautifully decorated dining room and easily accessible by road, with parking at the hotel and in the surrounding roads. A warm welcome awaits! We will be talking all things Make-up! Are you wearing the right colours for your skintone? Unlocking such mysteries as where to put the bronzer/blusher/highlighter, a healthcheck of your make-up bag, how to create a minimal day look or a more dramatic evening look! Let's try to unlock those mysteries and get ourselves looking our kind of fabulous! Tales of a Trolley Dolly! Shan Simpson is an ex BA Trolley Dolly, she has flown for over 10 years, flying around the world to many destinations, so as you can well imagine, she has seen all sorts of things along the way! She will unlock her secrets and tell us the juicy stories including famous people (nice ones and not so nice ones! ), the worst passengers, the scariest flight including the one where she was sure she would die, the flights that brought her to tears, and many ore! She'll give us the inside scoop on the naughty mile high club, how to get an upgrade, what goes on behind the scenes before you board and on the plane during the flight! The favourite destinations, all about Bournemouth airport and what's going on this year. She'll also be happy to answer all of those burning questions you might have! Julie Bramah from House of Colour, Bournemouth, will be showing us how colour can change our lives and make us shine! Do you have a wardrobe full of clothes and nothing to wear? Is your wardrobe full of black, or neutral colours? Are you looking to inject a pop of colour, but not sure what suits you? Find out how understanding what colours suit and complement your skin tone, and how magical it can be when the right shade of a colour lights up your face, makes your skin glow, your eyes sparkle and makes you look healthier and slimmer! Find out how even adding the right accessories can really enhance your look. Using these tips can save you time and money by reducing your wardrobe, yet giving you more to wear! We currently have no events listed for the Evening Club 19.30 to 21.30 (2 hours with light meal included).